The 2018-2019 flu season is ending up to be one the of longest on record. So where are we and when will it end? Influenza cases are declining, however, flu activity is still relatively high for this time of year, with 20 states continuing to report “widespread” flu. States on both the east and west coasts continue to battle high levels of influenza. “It always works for me. I am 87 and have been using. • CDC alerted physicians that influenza should be considered as a possible diagnosis for patients with respiratory illness, especially those 65 years and older who are at higher risk. • Flu symptoms reported are high fever, body aches, difficulty breathing, and cough. • Vaccine protection for the H3N2 strain “has been less than hoped,” according to the CDC. “This week activity decreased a little bit, but flu is going to be around for a while,”_ said Lynnette Brammer, from the domestic influenza surveillance team at the U.S. Centers for Disease Control and Prevention. The common cold is extremely common and affects people all around the globe. Interestingly, earliest cases may date back to Egyptian times. These pesky viruses evolved over millennium, mutate quickly and continually challenge our immune system. How common are cold viruses? • Children catch 6-10 colds annually; for school age children that number can be up to 12 times per year. • Adults get 2-5 colds a year, increasing with age as immune systems weaken. • Immune comprised persons are more likely to experience complications such as ear infection, pharyngitis or sinusitis. • Ethnicity has no impact on cold common rates. Don’t fall victim to these everyday bugs. Order Cold & Sinus Solution at Special price of $23.95 (Regular Price $29.95). “Cold & Sinus is a great product. H3N2 virus accounted for 62% of flu cases over the past week. H3N2 strains generally produce more severe symptoms. Main symptoms reported are severe body aches, chills, fever for several days, chest discomfort, acute lingering cough, and fatigue. This strain is also causing secondary complications from pneumonia. Most affected are persons 65+ years old with hospitalization rates sharply increasing, followed by children under five years of age. 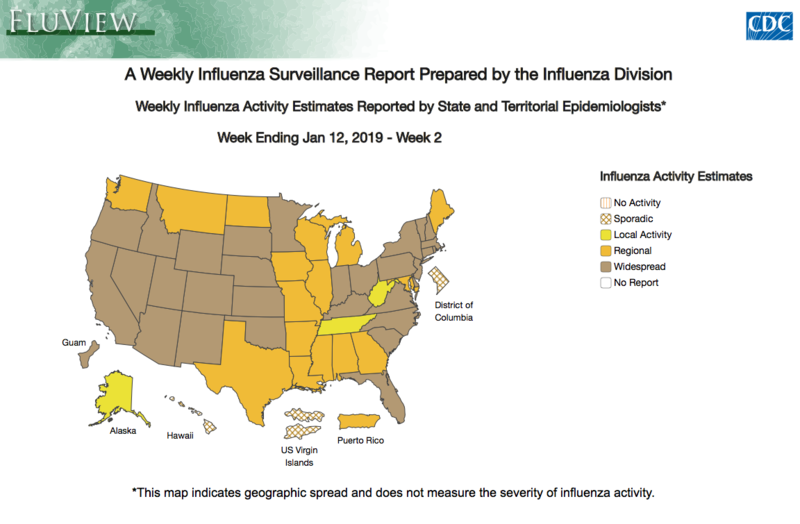 Widespread and high levels of influenza continue across the U.S. A more severe H3 strain is spreading quickly and will result in a second wave of the flu, extending the length of the season. • Widespread flu activity is reported in 48 states and Puerto Rico. • The number of outpatient visits from flu-like illness continues to rise. • The H1N1 virus has been the dominant strain for most of the flu season, however, a new H3 strain accounted for almost half of the flu cases over the last week. • H3 strains result in more severe illness. • If you already had the flu this season, you can get sick again from another strain. • The recent spread of the H3 virus indicates that high influenza levels will continue through March and into April. • Do not let down your guard, we still have a ways to go in the 2018-2019 flu season. It is peak flu season across the United States. We anticipate activity to remain widespread through February and early March. 1. Forty-seven states are experiencing widespread flu activity. 2. Influenza cases are reported to have moderate to severe symptoms. 3. Outpatient visits from influenza continue to rise across all regions. 4. H1N1 strain remains dominant, however, H3N2 is increasing in the southeast and midwest. The flu season is still going strong so stay vigilant with your weekly regimen. “Triple Flu Defense is the best. It has absolutely helped. Flu season is near peak across the U.S. with 45 states reporting widespread flu activity. Influenza cases are reported with moderate to severe symptoms. Outpatient visits from influenza continue to rise along with pneumonia related to the flu. View Flu Map for geographic information. Flu activity thus far this season has not come close to last year’s epidemic influenza levels. While we thankfully will not have a repeat of last year, the flu season is still going strong. 1. Thirty-six U.S. states are experiencing widespread flu activity. 2. Hospitalizations and outpatient visits from influenza continue to increase, particularly among children 0-4 years and adults over age 65. 3. H1N1 is the prevailing strain throughout the country, expect in the southeast where H3N2 is dominant. 4. The CDC has noted a genetic shift in the H3N2 and Influenza B/Victoria strains which may pose further problems later in the season. These signs indicate that there still is a ways to go in the 2018-2019 flu season. So stay vigilant with your flu regimen throughout the remainder of the winter months. Influenza cases continue to spread across the U.S. with 30 states reporting widespread flu activity. HiN1 virus remains the most prevalent strain except in the southeastern states where H3N2 is dominant. Extensive genetic shift has been noted by the CDC in the H3N2 strain and Influenza B/Victoria which may pose further problems as the flu season progresses. Categories Select Category cold and flu season flu H1N1 H3N2 Health homeopathic medicine homeopathy influenza virus medicine natural ragweed ragweed allergy ragweed season vitamin what is the flu?